Hello! Welcome to this hidden page on my site (someone must have sent you here - thanks friend!) - the podcast editing side of my business. I’m Matt, an actor with an eye for the technical aspects of performance, a computer, and a keen interest in problem solving. 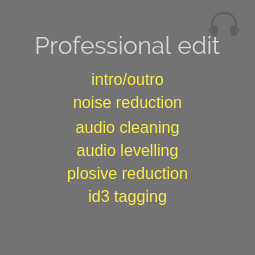 I’ve been editing podcasts since the beginning of 2018 and decided recently to offer my services to others. I’m currently working on the wonderful Nicky Raby’s podcast, Dreaming & Doing. I have also worked with Tin Can Podcast previously. Below is a selection of packages which you may find useful. Instructions on how to get your files to me will be included in the order completion email. Orders will typically take 1-3 days to complete depending on file sizes and workload (I’ll always try to return the finished product as soon as possible!). 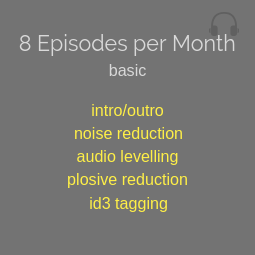 Intro/Outro - some people wish to record these as a separate files and mix them into the episode edit. 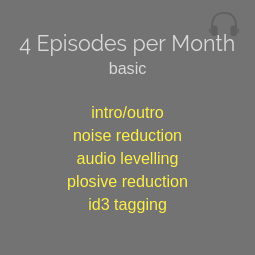 Noise reduction - this reduces background noise during episodes with excess ambient noise. Audio cleaning - reducing pops and crackles which sometimes affect playback quality. Plosive reduction - reduces popping/hissing on certain pronunciation due to microphone sensitivity. 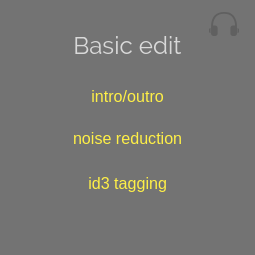 id3 tagging - This includes all the metadata your files need to be recognised by streaming services eg iTunes/Spotify etc. I’m not currently creating content. Music and sponsorship content should be sourced and appropriately licenced by you and sent to me along with the episode file. For packages requiring episodes to be uploaded to a hosting site all passwords will be treated with the most strict confidence. If you have any questions please use the contact form at the bottom of the page.